Editor’s note: This is part three in a five-part series about the environmental histories Jess Dunkin encountered while travelling from Ottawa to Yellowknife this past spring. Read the full #NextStopYZF here. Day 4 was my longest day of travel. I drove more than a thousand kilometres across four states: Illinois, Wisconsin, Minnesota, and North Dakota. There was much to see between Chicago and Fargo, which made choosing just one topic difficult. I settled upon the place that left me slack-jawed: the Wisconsin Dells. I began seeing signs for the Dells shortly after leaving Madison. There was something familiar about the name. I thought perhaps it was referenced in the Little House on the Prairie series. Like my visit to the Indiana Shore, I made the decision to turn off the highway at the last minute, drawn in part by the possibility of a connection to Laura Ingalls Wilder. I grew up reading and re-reading the books and I’ve always been curious about the places Wilder lived. While I appear to have imagined the connection between Laura Ingalls Wilder and the Wisconsin Dells, the area has provided inspiration to other American writers, including Aldo Leopold, whose Sand County Almanac is considered one of the most important books in the history of American conservation. Leopold and his family spent week-ends and summers in a renovated chicken coop on 80 acres near the Wisconsin River, only ten miles or so from the current town site. In making the Dells his vacation home, Leopold was following in the footsteps of numerous middle-class Americans before him. Beginning in the mid-nineteenth century, the deep gorges and fantastical sandstone rock formations that line this section of the Wisconsin River drew residents of Milwaukee, Chicago, and points further afield. Photographer Henry Hamilton Bennett played an important role in establishing the Dells as a “place of leisured retreat.”  Frank H. Goodyear argues that “Bennett’s camera helped to organize the experience of interacting with this largely unseen wilderness” by lessening the “sense of displacement experienced by the first time tourist” and making “the site a more approachable and consumable landscape.”  Local railroad companies hung Bennett’s prints and panoramas in their stations and distributed his stereoscopes to libraries across the region to entice potential visitors. 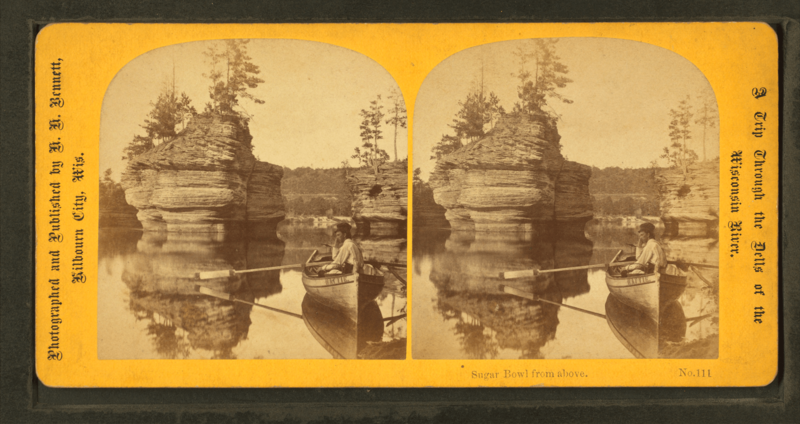 Bennett did more than photograph the Dells, he also named a number of the geological features along the river, including Lone Rock, Phantom Chamber, and Lover’s Retreat. H.H. Bennett, “Sugar Bowl from above,” c. 1880. Available through Wikimedia Commons. To be clear, the Dells was no terra nullis, awaiting a photographer’s fanciful names. The people of the Ho-Chunk Nation call this portion of the Wisconsin River, Nee-ah-ke-coonah-er-ah, which roughly translates as “where the rocks nearly strike together.” It long served as a way station for the Ho-Chunk as they travelled between agriculture sites to the north and fishing and hunting grounds to the south, a place of spiritual and physical renewal (the Dells was known for its abundance of game). While their numbers declined because of disease and forced relocations, the Ho-Chunk did not disappear from the Dells. Steven Hoelscher’s research shows how the Ho-Chunk contributed to the local tourist industry as it took shape in the late nineteenth and early twentieth century. Today, the Ho-Chunk Nation has more than 7000 members spread across seven counties in Wisconsin. The Wisconsin Dells of today would be unrecognizable to Leopold and Bennett. In addition to having a live-action zombie experience, a Mount Olympus theme park complete with a giant Trojan horse, mini golf courses, ziplines, and go-cart tracks, the community of 2,700 people can claim the greatest concentration of water parks on the planet. It also boasts the world’s largest outdoor and largest indoor water park. Cynthia Barnett estimates that collectively the various parks hold 20 million gallons of chlorinated water. This was not the last time I saw oil extraction equipment on the drive to Yellowknife. They reappeared west of Saskatoon and were never far from view through much of central Alberta. These early encounters with petro harvesters were notable for more than being my first glimpse of derricks. Their positioning also stood out. Primed by Edward Burtynsky’s Oil series, I was expecting fields of pump jacks like those he documented in California. Instead I saw lone derricks surrounded by an expanse of farm field, their hammer-shaped heads bobbing up and down in the late afternoon sunshine. I wanted to understand the arrangements that permitted this kind of oil extraction. Did farmers own the pump jacks? Did they lease land to oil companies? I was also curious about the environmental repercussions of these arrangements. As I tried to answer these questions, I discovered there is so much more to say about oil in North Dakota. The state has had an oil industry in some form since the 1930s. However, for much of the twentieth century, extraction here made little financial sense because the oil was contained in shale rock formations. With the development of new drilling technologies, namely hydraulic fracturing or fracking, oil extraction in North Dakota became financially viable. 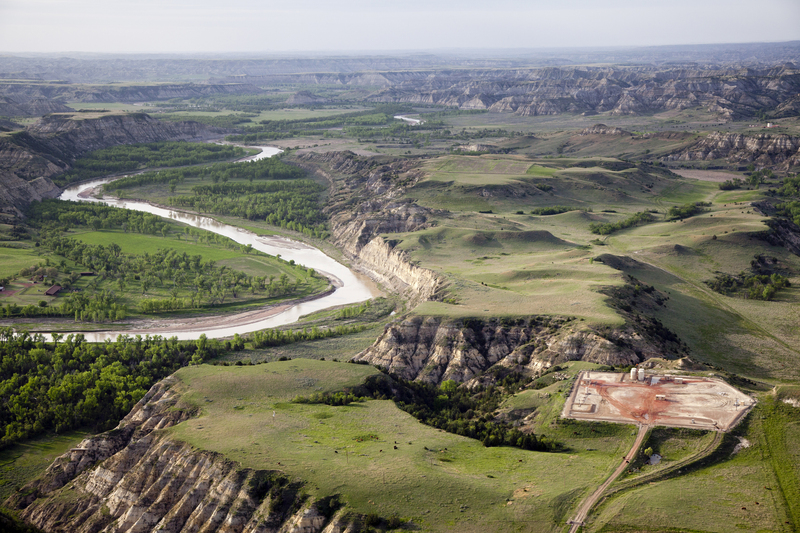 “Oil pad near Little Missouri River” by NPCA Photos is licensed under CC BY-ND 2.0. The discovery of the Parshall Oil Field in the western part of the state in 2006 marked the beginning of North Dakota’s most recent oil boom. According to Time magazine, the state produced more than one million barrels of oil per day in 2014. This number is expected to climb to a peak of 1.5 million barrels in 2016. As a result of oil, the state can now claim the fastest growing economy in the country with an unemployment rate (2.6%) that is well below the national average (6.3%). The Atlantic published a photo essay documenting the booming oil industry in North Dakota in March 2013 that is worth seeing. While North Dakota may be the number two oil-producing state in the US, at present, it only has two refineries, located in Mandan and Dickinson. They are capable of processing 68,000 and 20,000 barrels a day respectively. The rest of the state’s crude is shipped south and east via railway and pipeline. 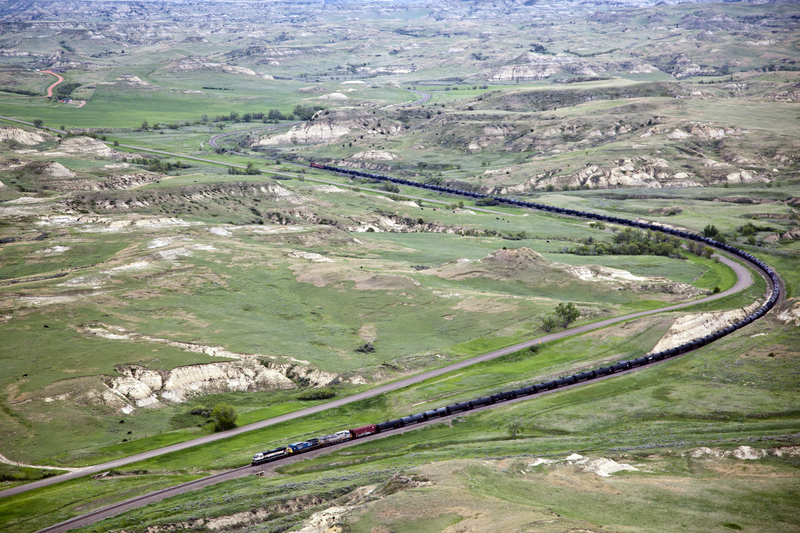 “Bakken Crude Oil Train” by NPCA Photos is licensed under CC BY-ND 2.0. Proponents of resource development often tout the local benefits of, in this case, oil exploration. The booming North Dakota economy seems the perfect example of this. However, more often than not, the money generated by large-scale resource development travels outward. Edwin Dobb, writing for National Geographic, notes in the case of North Dakota that out-of-state workers are paying taxes and debts in their home states, while profits from the wells are reaped by oil company executives and shareholders who could live in Texas, Canada, and beyond. Most importantly, the costs of oil production, but particularly the environmental costs, are often paid locally and North Dakota is no exception. Most recently, a train carrying Bakken Shale crude derailed near Heimdal in north central North Dakota. Six tank cars carrying approximately 180,000 gallons of oil burst into flames. 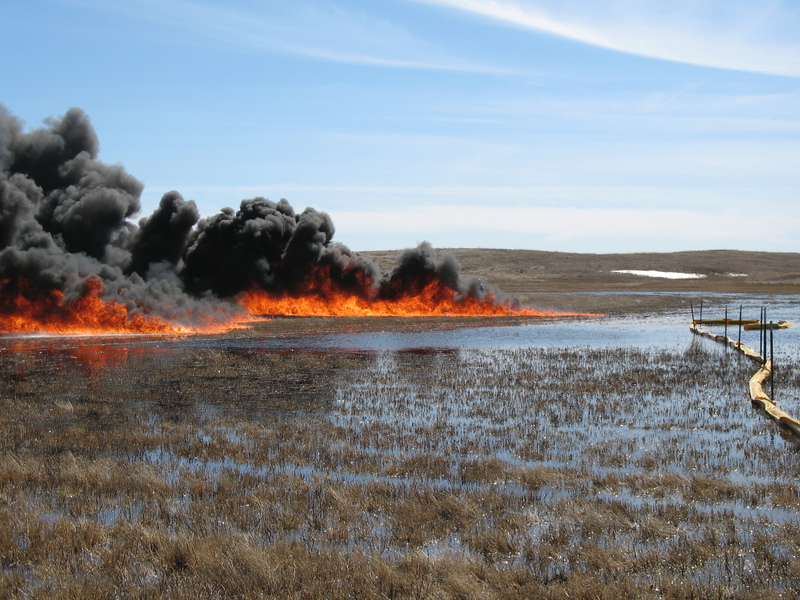 “In situ Burn on Wetland” (Mountrail County, North Dakota) by USFWS Mountain-Prairies is licensed under CC BY 2.0. News of oil spills dominate accounts of the environmental consequences of oil production. There are other costs, though. In 2013, for example, more than 400 barrels of wastewater spewed out of a ruptured pipeline in Bottineau County. Wastewater contains such high levels of salt that it can sterilize land and poison cows. But what of the derricks on farmland? 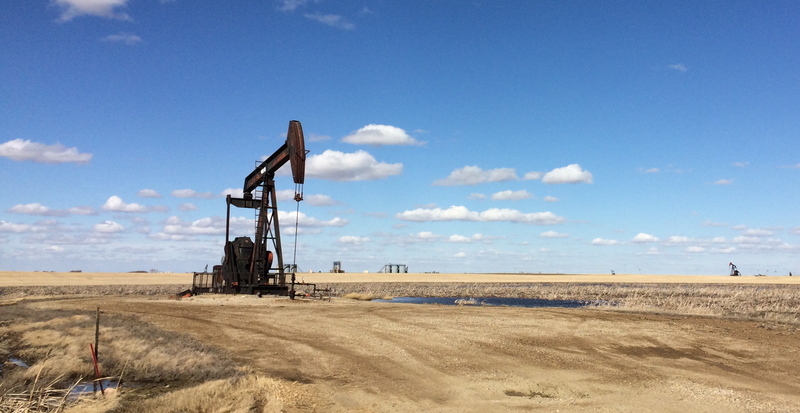 In North Dakota, landowners can separate surface rights from mineral rights. Some farmers have sold their surface rights in order to pay bills or purchase new equipment. Dobb tells the story of a family in the White Earth Valley who purchased a 1000-acre parcel of land, only to discover that the mineral rights had previously been sold in 5-acre parcels to people around the country. These parcels in turn had been bequeathed numerous times, so that 110 people owned the mineral rights just for the 40 acres surrounding the family home. In this case, the family had no control over the positioning of the pump jack. It stands 800 feet from their house. Those who own the mineral rights to their land can make money from the arrangement, but even this is fraught. In 2007, Bonnie Carson and Dennis Murphy signed a contract with Encana Corp to operate a well on their property near Stauffer, Alberta. In 2010, the well was cancelled, sealed with concrete, and transferred to Bonavista Energy. Bonavista has conducted some remediation work, but Murphy and Carson claim it was not done properly and the 4-acre parcel remains unfarmable. In part four of Next Stop YZF, I escape an early spring snowstorm at the Royal Saskatchewan Museum and spend some time thinking about prairie sentinels. Steve Hoelscher, “The Photographic Construction of Tourist Space in Victorian America,” Geographical Review 88, no. 4 (October 1998): 548-570. See also Steve Hoelscher, Picturing Indians: Photographic Encounters and Tourist Fantasies in H.H. Bennett’s Wisconsin Dells (Madison, WI: University of Wisconsin Press, 2008). Frank H. Goodyear, “Directing the City to the Ountry: Henry H. Bennett in the Wisconsin Dells,” History of Photography 24, no. 2 (2000): 163-168. I remember passing the Wisconsin Dells and being fascinated by the area on my move from Rochester, New York to Saskatoon. I did not know anything about its history though, so interesting! It’s definitely worth a visit, Jessica, although as the post suggests, it left me slack jawed. I can’t imagine what driving through in July would be like. Likely wall-to-wall people.